This chilli sauce is made when I have an abundance of chillies in my garden. Or when I bring chillies back with me from Italy. I am not one for very hot food as my sweat glands cannot take the heat. If food is too hot but still palatable I will eat it – but you will see straight away from my face that the meal was too spicy for me. This chilli sauce is not for my palate – it is really hot. But, unlike most hot foods that I come across, it is very flavoursome. The ingredients make this chilli sauce have a flavour punch that you will enjoy, and you can scale down the heat by using mild chillies, or by removing the seeds from your chillies. I used medium hot chillies with the seeds, as we were having friends to stay for a week who love heat, and this chilli sauce was a great way for me to spice up their meals, while still being able to eat my own. Do you eat spicy foods? Both hubby and I love spicy. This would be perfect for us! I love spicy food and this sauce sounds and looks amazing! Will give it a try soon. Love, love, love spicy – my whole family do luckily. They’d like this sauce. I love chilli sauces! I would die without chilli sauces! Singaporean in me talking 😉 This is a new one for me and I’m definitely up for trying this one. Sounds delicious and love the balance of flavours from the other ingredients going in. Yum! Hot foods leave me cold, Tandy 😀 But I know what you mean about the flavour. Some of the most flavoursome salsas I have ever had have been extremely hot! I love hot chili also and this sauce looks terrific! I had just picked all my chilli, capsicum and tomoatoes so I could make a chilli sauce too. Thanks for sharing, I will have to try some ginger in my sauce too. I look forward to reading your recipe Julie! 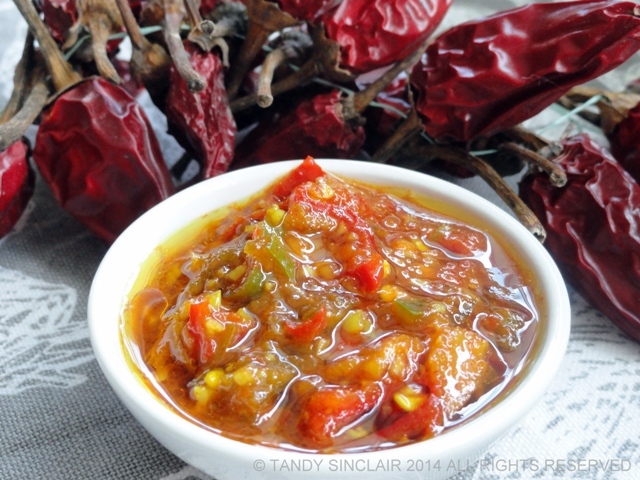 This chili sauce looks delicious and so flavorful! I love hot sauces! Definitely want to try this! That definitely looks like my kind of sauce Tandy! But great idea to be able to give your friends something spicy while being able to eat too 😀 It’s so easy too! It is the easy bit I like the most! Thank you Claire, and I hope you enjoy it! Love the chili ginger combination, sounds delicious! Let me know what you think Squishy! Then I am sure this will be perfect for you! I love spicy foods so this looks great. How do you think would be a great way to use this chili sauce Tandy? btw, lovin your spicy spiced sauce my fried, i guess i’m enjoying it more with mytofu!!! Wow, you really like it hot Dedy! I’m not one for too hot a chilli either Tandy. Your sauce looks lovely. I just loooooove hot food and this sounds delicious!! My husband adores chilli sauce and we always have few different jars on the go in the fridge at a time. I love chillies and spicy food but don’t usually want extra sauce. This is something he would love me to make though. I think I’d like your sauce very much Tandy – I love a hot chilli, from almost any culture – sambal belacan, piri piri sauce, harissa – love them all! 🙂 The only line I draw is at some of the truly crazy hot American sauces, which seem to be designed purely as a test of manhood for the brave souls that attempt them. I cannot understand why on earth people need to eat something so hot that their taste buds fry!